the 1952 Topps baseball cards. the 1952 Topps #311 Mickey Mantle. Add to that the second year card of Willie Mays, the Eddie Mathews rookie card and appearance of countless other Hall of Famers like Jackie Robinson, Roy Campanella, and Yogi Berra and you can see why collectors love these cards. Rare “high number” cards, error cards and multiple card back variations keep collectors plenty busy trying to build a complete set. That said, here is a complete guide to everything you need to know about these legendary baseball cards. The first thing most collectors ask is: how much are 1952 Topps cards worth? The answer can depend on a variety of things. Most know that Mantle’s rookie card is by far the most expensive in the set and one of the most valuable baseball cards in the entire hobby. Overall, they’re generally some of the pricier cards in the hobby due to the set’s popularity. But they’re not all going to pad your retirement fund. Some common cards can go for less than $10 if they’re in poor condition. That’s quite the range. So it’s very important that you know exactly which card you’re talking about and just as important, what kind of condition the card is in. How do you determine the card’s condition if it hasn’t already been professionally graded? You can always refer to cards listed for sale online as a reference only. See what a Gem Mint 10 or NM-MT 8 looks like by finding current examples listed for sale. But please be careful and remember those are only references. It’s just too tough to notice some condition issues, especially surface and gloss issues, by looking at you card with the naked eye and comparing it to a professionally graded copy online. Remember: Professional graders use high-tech optical equipment when reviewing them and grading them. They can see errors you can’t. Even the 1952 Topps baseball packs have become instantly recognizable throughout the hobby. The green over red design with the baseball icon in the middle have become fixed in collectors’ minds. Not to mention the 5 cent price tag in the upper right. Imagine that each of these cards once only cost a penny! Even more rare than packs are the cases in which these cards were shipped. Actually, you’ll probably only ever hear of empty cases nowadays as sealed cases are all but long gone. Most baseball fans may not recognize Pafko but most baseball card collectors do. As card #1 in the set, his card usually suffers from abnormal wear and tear from being the first card in the set. That meant he was at the top corner of the printing sheet (exposed to increased wear) and kids wrapped their card stacks (with his usually on top) with rubber bands. Rizzuto is one of several Yankee Hall of Famers included in the 1952 Topps set. The legendary pitcher really stands out here atop the bright red background. 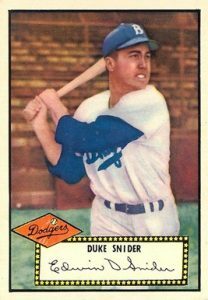 You’ll notice Snider is shown in action which wasn’t common on ’52 Topps cards. One of two key error cards in the set is the version of card #49 with Johnny Sain’s biography on the back instead of Page’s. The other key error card which features Joe Page’s biography on the back instead. The legendary “Heater From Van Meter” is shown with a bright smile atop a bright yellow background. Martin won five World Series titles with the New York Yankees: four as a player and one as a manager. Berra was a key part of all those Yankee championships during his playing days and here he’s shown in his famous pinstripes. This is May’s second most valuable card behind his 1951 Bowman rookie and its instantly easy to tell why collectors love this card. The Holy Grail of post-War baseball cards and perhaps the most desirable of all baseball cards in general. This one ranks high up on the list of Robinson’s most desirable cards of all alongside his 1948 Leaf and 1949 Bowman issues. Campy’s 1952 Topps card is one of his best as the iconic Brooklyn Dodger looks off into the distance with a nice big smile. Shuba may not be a household name but his rookie card is among the tougher high number rookies to find in top condition. The Hall of Fame shortstop was instrumental in helping Jackie Robinson enter the Majors as the combo formed a strong bond and fearsome middle infield. The second most desired high number rookie, Hoyt Wilhelm made his appearance in the ’52 Topps set at card #392. Similar to Pafko, Mathews’ position as the last card in the set exposed him to just as many condition risks as mentioned with card #1. But he also happens to be a Hall of Famer so that boosts his value way more than Pafko’s.